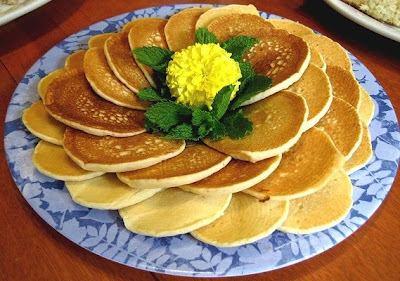 Here it is the pancakes recipe that allows you preparing a very special breakfast without using any kind of ready-made mixtures but selecting all the ingredients by yourself. Maybe because they are native to America, pancakes are one of those mysterious recipes like "How are they made? ", but they actually are made with very easy to find ingredients such as eggs, milk, flour and butter. The trick is in baking powder which makes them become from simple crepes to typical pancakes. I think preparing on Saturday and Sunday morning is quite funny. It reminds me of an "American movie". Often in movies you can see the American family that stands around the kitchen table and gorge themselves on pancakes sprinkled with maple syrup. Can you imagine it? They represent relax, break, a family moment where you stand all together around the kitchen table, with pyjamas on, without any hurry because there's no school or work. Pancakes are good in many ways, even alone or simply sprinkled with icing sugar. The proof of the pudding is in the eating! My little daughters love them with cherry jam or the classic nutella. The recipe I'm going to show you has been sent by Michela Bernacchi who has adapted it for Thermomix! Another breakfast cake I suggest is the Milk Cake. Put butter in the bowl. 1 Min. 70°C Speed 1. Add milk, egg, sugar, flour and baking powder. 30 Sec. Speed 6. Stir with the spatula and mix again. 5 Sec. Speed 6. Heat up a griddle or a non-stick pan. Cover it with butter and pour in a bit of the pancakes batter using a ladle; form 8 cm diameter discs. Cook pancakes 1 Min per side. Cover the pan with butter again and repeat this process until the batter finishes. They are delicious with maple syrup, honey or with Thermomix Chocolate Hazelnuts Custard. To find the perfect cooking time, look at the pancakes surface. When they make "bubbles" you may turn them. Then wait for some seconds and they'll be ready. I suggest you try them with raspberry jam and in general with all the red fruits one. Eli suggested this recipe; she wrote: "I have a lightly different recipe. After trying to make the perfect pancakes since I tasted them in Canada this one is the best one I think". Put all the ingredients into the Thermomix bowl. 1 Min. Speed 6. Put a little bit of vegetable oil in a non-stick pan and pour in a bit of the pancakes batter using a ladle; form 8 cm diameter discs. "They're perfect with maple syrup (you find it easily in supermarkets) and strawberries!"